The unique offset head design eliminates cross-pins and cotter pins to retain the pin. A nut ensures the pins remain in position. A lubrication groove provides a path for lubrication. End-of-pin lubrication allows easy access for servicing grease points, which are visible from the side of the loader. The parking mounting system on the D120 Loader is designed for easy removal and mounting to and from the tractor without tools. 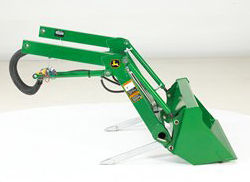 Similar to that of the 305 Loaders, the D120’s parking stands are kept in the torque tube for easy accessibility. 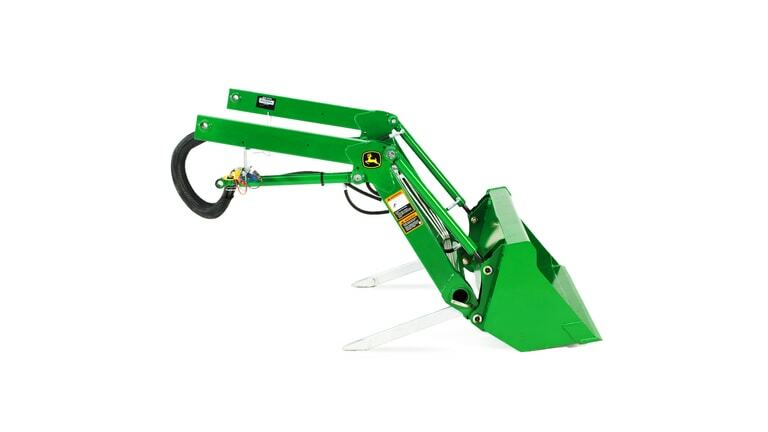 To park the loader, simply install parking stands, remove pivot pins from the mast, disconnect the hydraulic hoses, and back out the tractor.